The National Youth Music Theatre's production of Prodigy at London's St James Theatre offers much to celebrate in Britain's musical theatre talent, both in composition and performing. With lyrics, book and some gorgeous music all from the emerging wunderkinder that are Jake Brunger and Pippa Cleary, the show is themed around an X-Factor type reality TV show – themed around the search for a child prodigy musician. 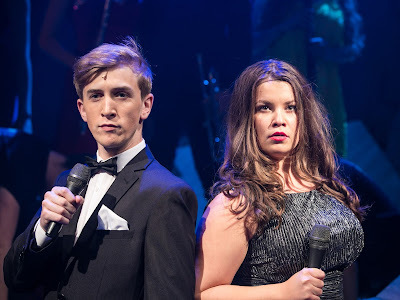 The ensuing combination of pushy parents, gifted kids and the celebrity worship of TV has already proved fertile ground for musicals - there are hints of I Can't Sing!, Matilda and even an occasional whiff of Hairspray in the evening’s entertainment - but where NYMT continue to triumph is in assembling a troupe of talented young performers, all under 23 and then exposing them to the creative genius of acknowledged industry experts. The satire kicks off mercilessly with Callum Howells’ and Francesca McKean's sizzling take on the superficial TV hosts that typically give these shows a pulse. Ridiculing (but not mimicking) the likes of ITV's Dermot O'Leary et al, these two gifted performers, under Kate Golledge's perceptive direction are spot on. There are too many characters to name and credit in this review - all were excellent, but some are given moments of creative genius from Brunger and Cleary that linger on long after the youthful band's exit music, under the intuitive musical direction of Candida Caldicot, fades away. Talent show finalists Kate and Luke (Caroline Whittingham and Harry Al-Adwani) provide the unlikely love story of the plot, in a heart-warming tale that sees romance blossom from adversity. Much respect is earned by the bulk of the cast who at times take on some challenging actor-muso responsibilities, with one of the show's most remarkable melodies coming from Al-Adwani's solo on an all too rarely heard vibraphone, providing an almost ethereal treat. Rupert, the villainous contestant of the piece, is played by Jamie Dodd who turns in a very convincing cad. Jake and Pippa’s collection of parents straddle Britain’s social strata and are cleverly fleshed out. Again, amongst excellence all round, it is Emma Ernest’s Eileen (Kate’s parent) that is gifted the juiciest of roles, the actress punching well above her 19 years in a monstrous take on motherhood that almost suggests a 21st century Momma Rose! The plot brims with perceptive wit and in Laura Barnard’s alcoholic TV producer Melissa Marconi, another cracking stereotype of the glib media world is brilliantly nailed. Credit to this show’s creatives – they’ve even managed to throw in a jazz hands showstopper too. Luke Rozanski and Hannah Irvine (14 and 12 respectively and both great violinists) bring the house down with their hilarious younger siblings’ plea, We’ve Got Talent Too. And a worthy mention for Prodigy’s other “Finalists” Amelia Thompson (clarinet) and Seophora Parish (piano), both of whom put in accomplished performances. 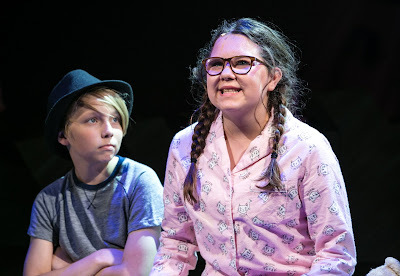 Bravo to tireless producer Jeremy Walker, for it is largely down to his endeavours that NYMT continues to nurture talent across musical theatre, developing not just performers, but writers and creatives too. Prodigy only runs until tomorrow and if you can get your hands on a ticket you won’t be disappointed.